Grizzly bears are a type of wild animal in Far Cry 5. They’re part of the Clinical Study story mission, in which players have to get 3 undamaged grizzly bear skins. Since the beasts rarely appear, getting the skins can be problematic. 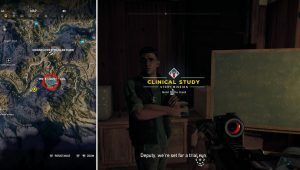 This guide will show you some Far Cry 5 grizzly bear locations and help you complete the Clinical Study quest. The mission can be started once you complete the Doctor’s Orders quest. 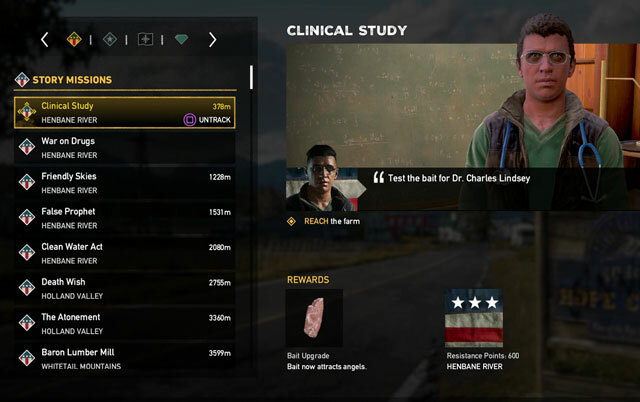 The last step of this mission requires you to talk with Dr. Charles Lindsey in Hope County Jail, in Faith’s Region. If you talk to him after it’s done, he will give you the Clinical Study task. You’ll need to pick up the test bait from the nearby desk and go to Pepper Residence, a nearby farm. We strongly advise you not to use fast travel during this mission. Sometimes the quest counters get messed up after loading an area. Your objective is to kill only the cultists, which means you need to approach silently. These cultists are grouped together with the angels, the enemies with white clothes, engulfed in green clouds, and without weapons at their disposal. During this part of the quest, the angels shouldn’t be harmed. You’ll need them for testing later on! Once all the cultists are dead, including the sniper on the hill above the Pepper Residence, the next objective will trigger. The table we need to place the bait on is close to the hard working angels, near the field. It is a grey metal box, near the phone pole. Now climb onto the roof of the nearby shack and watch the field test unfold. After all angels and new cultists have been defeated, you’ll be able to loot the undamaged skunk skins from the remaining dead animals. There should be more than two. Where to find Undamaged Grizzly Bear Skins? 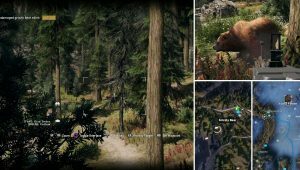 As you get to this part of the quest, you might start wondering where to find these grizzly bears. As we left Pepper Residence, running toward Hope County Jail, new angels started showing up, spawning grizzly bears on death. We managed to gather two skins this way, but it was not enough. The grizzly bear hunting ground we’ve found is far in the northern part of the map, in Jacob’s Region. It is located southwest from F.A.N.G. CENTER, and west from Whitetail Park Ranger Station. Once you’re in the grizzly bear woods, be sure to have Boomer as your companion. He can track them more easily through the thick forest and make this much easier. The Ultimate Hunter homeopathics is useful too, and it can be crafted and used via the utility wheel. After some searching, we found and looted our last Undamaged Grizzly Bear Skin. The quest will be done when you go back to Dr. Charles Lindsey in Hope Count Jail, in southern Faith’s Region. He will give you a bait upgrade, letting you use it to attract angels as well. Not the kind you may have wanted, but still, better than nothing. You can find skunks southwestof rock bass lake, near the field. After you get the upgraded bait from him, if you talk to him again, he says he’s still waiting on items he needs. What is he talking about now? As useful tip to add in here, would be to use a compound bow or recurve bow to hunt the grizzlies. This should not you all the skins you’ll need in one whack. This is all assuming you have the perk that gets you up to 4x more skins per kill ( I don’t readily remember the perk name, sorry).